This post has been viewed 1168 times. Rev.Jimmie, we want to take you into the lives of two Israelis, co-workers in Yeshua, who are making a huge impact here in Israel. We wish that you would have been with us as we visited them on Shabbat (Saturday). We’re sure that you would have been blessed spending time with them. Yossi will be one of our main outreach workers/evangelists getting the Messianic Prophecy Bible out to the city of Rishon Letzion (which means the First to Zion). It was a beautiful, sunny Saturday morning as we stood in front of Yossi's house. It was about eight o'clock in the morning, and every few minutes Orthodox Jews were walking by, on their way to the Orthodox synagogue down the street. As each one passed Yossi, they smiled at him—he is a very likeable man—and greeted him saying, “Shabbat Shalom Yossi. How are you doing Yossi?” Just about everyone in his neighborhood knows him as he has shared the Gospel with them, as well as with all of the rabbis in the city! Yossi and his wife Norit are Israeli-born Jews (Sabras), who live in Rishon Letzion, south of Tel Aviv. Since Norit came to know Messiah, she was so excited about her new life in Yeshua that she began telling her family members, friends, and neighbors about Him, and one by one they started accepting Him! In the three weeks after we met Yossi and Norit, someone was getting “saved” every week! How amazing to see so many Israelis coming to faith in such a short time. Their home fellowship, which meets every week for Bible study, worship and prayer has 20 people—all Israeli-born Jews—which makes it truly unique. Here in Israel the congregations are mixed, mostly of Russian and American immigrants. And although this is just a small home group, it is the only fellowship that is made up of 100% Israeli-born Jews. We truly love these two steadfast people in the faith, and have been in their home a number of times to hear their testimonies and pray with them. We know first-hand how difficult it has been for Yossi and Norit as Believers here in Israel where as many as 99.9% of the people do not believe in Yeshua. While many non-Believers in Rishon Letzion are somewhat accepting of Yossi and Norit’s faith, the couple has experienced major opposition from rabbis in the community. Anti-missionaries have stood outside of their house during their Bible studies, shouting and screaming, telling all of the neighbors that they are from Satan and to stay away from them. Norit shares that one of the most hurtful things is how her children have been teased and harassed at school by the other children because of their faith in Yeshua, and how they have come home crying. 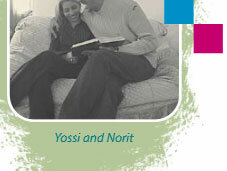 Yossi & Norit who are suffering for their faith! “When we accepted Yeshua into our heart, the people in Rishon Letzion heard about it,” stated Norit. “The opposition we faced actually resulted in people—including rabbis and anti-missionaries—coming to see us. Some came to persuade us that believing in Yeshua was not the truth, but many others came open-minded and inquiring. They wanted to know why there was such an uproar, and they wanted to know what we believed. “They wanted to know what we believed because these are people who have known us for all of our lives, and they view us as just regular Israelis, not ‘Christian missionaries from another country.’ We are simply 'Norit and Yossi' to them, and these people trust us,” she said. “We would point them to the Messianic prophecies in the Tanakh (Old Testament),” continued Norit. “And that led to 20 Israeli Jews coming to know Yeshua as their Messiah in just one year. Praise God—now they have new life! Yossi is a true evangelist. His heart is simply to tell everyone about Yeshua, and he has a burning desire to work with us to give out a Messianic Prophecy Bible to every home in Rishon Letzion. Yossi speaks from personal experience. The Messianic prophecies were what brought both him and Norit to believing in Yeshua as their Promised Messiah. 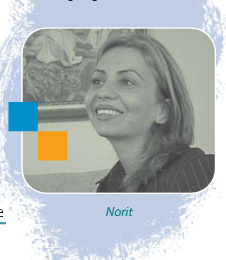 Norit searched three years for Messiah by reading her Tanakh and regularly visiting the local library for additional resources. After she accepted Yeshua into her heart, she held Bible studies with her unsaved husband for two years. Finally, one night, he said he thought he might be ready to open up his heart to Messiah. Norit told Yossi to take the Tanakh and study on his own until Yeshua was revealed to him. Since then, both have been called to evangelism. 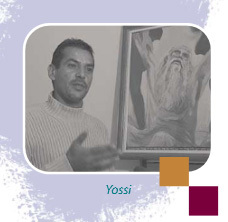 Why have we taken a good part of this letter to tell you about Yossi and Norit Eliyahu? Well, just as we believe with all our heart that the Messianic Prophecy Bible will have a profound impact on reaching our Jewish people around the world once it is completed, published, and distributed, we believe that it is now the time to be raising up evangelists/outreach workers to go into the “harvest fields” to reach our people and disciple them once they begin to read and study the Messianic Prophecy Bible. We have had meetings with many of the congregational leaders in Israel, discussing how we will reach their city with the Messianic Prophecy Bible utilizing outreach workers from their congregation. It isn't every day that there is an opportunity to take part in a work to the Jewish people that has never been done before. This Bible Project is something that will truly help set the stage for the return of Messiah Yeshua to the Jewish people here in Israel, and around the world. As excited as we are to know that our people will soon have the Messianic Prophecy Bible, we are just as excited to know that there will be dedicated Believers like Yossi and Norit, as well as many others, who will be full-time Israeli outreach workers distributing Messianic Prophecy Bibles and discipling Jewish people who are seeking the truth about Yeshua. Just as Yossi and Norit have been steadfast and unwavering in desiring to reach Jewish People with the Gospel message, we pray that you will continue to remain steadfast and unwavering in helping to make the Messianic Prophecy Bible a reality.